“Transform your rigid leaf sprung vehicle into a comfortable off-road performer with the EFS Elite comfort springs range”!!! 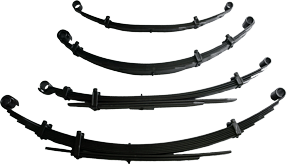 EFS Multi-Leaf Springs are made from high quality Japanese grade SUP9 & SUP9A Alloyed Carbon spring steel. Designed as a comfort Leaf Spring that incorporates special features , to give the driver a comfortable ride on road & increased control off road with increased articulation & clearance. Available in 30mm to 80mm raised heights with a slight increase in spring rates over the original equipment. Tapered Leaf Ends – To reduce the inter-leaf friction & to improve pressure distribution in the load bearing area. Bolt Clip Liners – To reduce noise & friction. Inter-Leaf Graphite Coating – For further reduction of friction. Shot Peened & Scragged Tested – To reduce stress & ensure longevity. Leaf Inserts Pads – For further reduction of friction.